Darjeeling Himalayan Railway has been on my wishlist for a long time. Train journeys have always fascinated me. As a child, I have traveled across the country on trains with my parents. Now that I do not get to use trains so often, they are a prominent part of my nostalgia. Apart from trains that work as a mode of transportation, India offers trains that define the ultimate luxury experience and trains that take you back in time with their steam engines. A few years back, I was fortunate to experience the luxury of Deccan Odyssey for 7 nights. This time it was the joy ride on Darjeeling Himalayan Railway. My sole purpose of visiting Darjeeling was to experience a ride on Darjeeling Himalayan Railway. It is one of the three Mountain Railways of India, along with Kalka-Shimla Rail and Nilgiri mountain Rail that is designated a UNESCO world heritage site status. It is interesting that the three living heritage railway lines are located in 3 different corners of the country. While Darjeeling Himalayan Railways & Shimla-Kalka Rail traverse through the Himalayan Hills, Ooty train traverses through the Nilgiris. 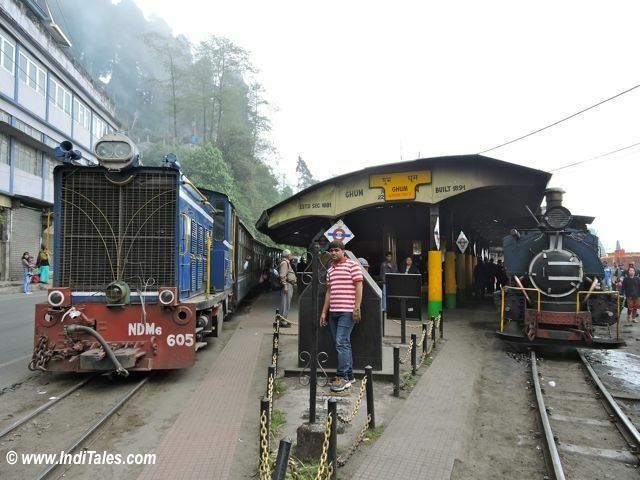 I had traveled on both Kalka-Shimla and Nilgiris – though much before my blogging days, it was Darjeeling Rail that was being elusive. I missed it last time I was in Bhutan and Sikkim, and now I realize that I must have just brushed past it. You have to see the Batasia loop on the Darjeeling-Ghum track to understand what it means. These trains go uphill and at places, the gradient is too steep for a train to pull. Engineers working on the Railway systems devised an innovation that included building loops or zig-zag tracks so that the length of the track increases and the gradient can be gradually increased. This also makes the train ride very smooth for the riders. So, it is the technical genius that the homage goes to. Darjeeling Himalayan Railway goes from an elevation of 100 meters to 2200 meters in just about 78 kms. Train connectivity made travel to and from the hills easier. It brought a cultural exchange between the people of hills and plains. This, in turn, led to an exchange of material goods and over a period of time they each influenced and became a part of each other. I got the first glimpse of Darjeeling station and the steam engine parked there as soon as we drove into Darjeeling. Next day morning we had nothing else planned except exploring the heritage train and its companion stations at Darjeeling and Ghum. Since we could not book our tickets online, we reached a good hour earlier – there was no way we could miss the ride. Our hotel guy kept assuring us that there are hardly any tourists and we would easily get the ticket. Well, we did get the ticket but we also learned that all the joy rides on toy train run full all the time. After ages, I filled the railway reservation form and got a paper ticket. 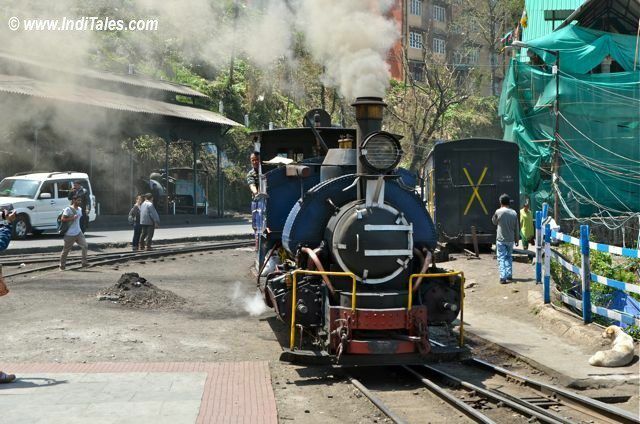 Minimal changes have been done to the Darjeeling Himalayan Railway since its inception in 1881. We wanted to ride the steam engine but then I realized there is a Diesel engine that just follows the steam engine one. I saw a good opportunity to click pictures of the steam engine while in action from my train. I did manage to click these small videos of the steam engine that was a sheer beauty to follow. Steam engine emitted so much smoke & soot that I am not sure if riding it would have been as pleasant an experience. Mahatma Gandhi & Mark Twain are among the famous people who rode this train. As we waited for the trains to arrive from their earlier trip, I admired the steam engine being prepared in the loco shed. Tourists, most of who were foreigners starting arriving at the station. Station itself is a heritage building as the ‘Stick No Bills’ sign would tell you. I wandered around the station clicking pictures and making sense of the place. There are pictures of the station and the train as it used to be when it was launched way back in 1881. I tried hard to visualize it but it was impossible for the place now is so damn crowded. In fact, the train track is pretty much on the road and sometimes too close to the houses, shops, buildings. Till I was aboard the train, I had doubts that the train can move without touching these spaces. However, once I boarded the train, I realized how narrow it is. It remains a wonder that the train system is working still after 135 years and serving the people of the region. As the steam engine chugged in the station, everyone gasped in awe. Everything else faded as the beauty rolled in – it was like watching an era walking into your lives for next 2-3 hours. The blue engine had a marking calling it ‘Iron Sherpa’. A small red board declared its no – 805. After the steam engine toy train left, we boarded our Diesel engine bound coach. It was a cramped space that seated 28 people in each of the 3 coaches. But then how much space do you expect on top of a 2 feet track. The train pulled out of the station and we were all ecstatic. We made the traffic on the road stop quite a few times. We made people standing out in front of their houses and shops, move in to make space for the train to move. There were children who waved to us, but most adults just wanted the train to move so that they can get back to their work. There was valley on one side and the city of Darjeeling on the other side. Sometimes the city was too close for our comfort, but then the view on the other side made up for it. The train stopped at Batasia Loop for about 10-15 mins. This is the loop that the railway engineers had built to negotiate a steep gradient in the hills. It is interesting when you go under a railway bridge and then turn around to go over it. In the center is a war memorial built to pay homage to Gorkha soldiers who laid their lives in various wars. War memorial is surrounded by manicured lawns. Batasia Loop is a good vantage point to see the Kanchenjunga range of Himalayas – you must pray for a clear day, though. An information board here talks about the films that have been shot at Darjeeling Himalayan Railway. The Darjeeling station is obviously as old as the Darjeeling Himalayan Railway, however, it looks nothing like its original version. There are information boards that show the vintage pictures of the Darjeeling station. The station in the picture looks far more enchanting than the current one – which is definitely a run down version of the original one even after you discount the vintage factor of the old black & white pictures. Another board draws the detailed route of the Darjeeling Himalayan Railway from Darjeeling to New Jalpaiguri – specifying the altitude and distance from Siliguri. Incidentally, the headquarter of Darjeeling Himalayan Railway is Kurseong and not Darjeeling or Siliguri. Ghum Station is the destination for the joy ride of toy train at Darjeeling. Train halts here for 30 minutes to let you see the museum and enjoy the Ghum station. The station itself is a heritage building and houses the DHR museum on its first floor. In bright yellow and red colors, this small platform will remind you of many film scenes that have been shot here. As we walked around the station – again observing the steam engine train that was just ahead of us – it was like being a part of a dream sequence. Mountains, valleys, a busy bazaar were all around us – the wandering tourists. Ghum Station is India’s highest Railway Station. I walked up to a post box that had the UNESCO world heritage site boards around it. When I turned around to walk towards the Ghum Station, I saw it sandwiched between the two trains and proudly announcing its date of birth – 1891. The single room Ghum museum takes the visitor through the times that Darjeeling Himalayan Railway has seen. It establishes the need for rail line by explaining how many different types of transportation people had to take or let’s say negotiate to reach Darjeeling from the plains. To cut down that time and add convenience – Darjeeling rail line was established. It incidentally runs parallel to the Hill Cart Road and would eventually face competition from the buses that used the same road but reached faster. Information boards explain the technical aspect of the train. There are paintings of stations, track, and loops that bring alive the initial days of Darjeeling Himalayan Railway. There are newspaper articles written about the railway and its famous passengers. There are various Darjeeling Himalayan Railways Logos. One of the logos dates back to 1879 – shows that the logo was conceived well before the launch of the railway in 1881. To me, the most interesting element was the old style tickets that came on a cardboard of the size of a matchbox. I wish the authorities issued the same kind of tickets for this joy ride. Watch this 3-minute video, We captured during our tour. A board at Ghum Railway station said – there are two unique railway experiences in India – Himalayan Railway and Deccan Odyssey. I was happy that this ride completed both the experiences for me. However, there is a lot more, that I want the railway ministry to work on making this an unforgettable experience for visitors. I am sure it would also help them generate some revenue. The tickets like I mentioned earlier can be old style – that can work as joy ride souvenirs for tourists. A tour guide on board, who will acquaint the visitors with the history of the Himalayan Railways in India. They can also give a walkthrough of the stations, museum, engines, train routes and the trains. A good storyteller can take the experience to another level. I want the Darjeeling station to be cleaner. If the visuals from the train can be cleaned that would be great though I understand it is not an easy task. It would be great if some refreshments can be offered to the tourists. Old style station Chai would also do. The shops at both Darjeeling & Ghum station can also be run vintage style. Please have souvenirs and mementos designed for the Darjeeling Himalayan Railway that visitors can buy and take back with them. Least of all you need to have a small booklet that gives all the information about the railways. Online booking of tickets should be allowed on IRCTC or the Indian Railways website. Kolkata – Colonial Calcutta Heritage Walk. ‘Ekla Chalo Re’ by Rabindranath Tagore. Chardham on Solophok Hill, Namchi, Sikkim. I went around this area some time back but somehow missed Darjeeling. We flew to Bagdogra, drove around Sikkim & Darjeeling and took a train back from New Jalpaiguri to Kolkata via Shanti Niketan. Such a lovely write up! Now I ought to travel on that train some day! While going up, which side gives the best views? Left or right? I mean mountains are on your right or left while going up? Valley’s will give far better views, correct? Darjeeling to Ghoom – you have valley on the right and hills on the left. Views are not really great as you see people and shops all around. On right you see a bit of valley and on left you realize how close the train moves to the houses and hills. Incidentally, you get the same view both up and down unless you exchange seats with someone. Thank you Rupam, and that you for sharing it on Social media. I have been to Matheran in Maharashtra and had a ride in Matheran heritage Train. It was an such an enjoyable journey in monsoon season. But Darjeeling train seems more interesting through this post, hope to travel there one day for sure. Thanks. Fantastic place to visit in india and a different kind of experience. Yes Kanchan, it is one of its kind experience. Lovely photos & great story! It’s definitely on my India bucket list. Thanks Danial. It is a must ride if you love vintage trains. Wow! Even I love to travel by train. But nowadays due to time constraints we are avoiding that. You had lovely trip ! Ghum station looks so colorful. Loved it. Ranjana, don’t think you can really use this train for travel. But it is a fun riding this train, or even driving on the road along with it. A one of its kind travel experience it is. Fantastic Anuradhaji. Your pictures and post both are wonderful and makes me feel like immediately packing up and leaving for this place. Recently, I made a personal record for traveling 83 hours & 25 minutes on India’s Longest & World’s 10th Longest Running Train #VivekExpress, that passes through Siliguri and New Jalpaiguri. Had Indian Railways allowed me a break journey for 3-4 days, definitely I would have experienced this train ride. I was so so near Darjeeling. Thank you Shaunak Ji. It is always good hear to hear from readers. Now that you have the ‘Ichha’ of visiting DHR, it will happen soon. 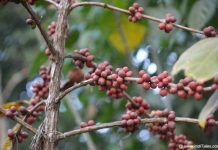 Thanks much Anuradha for writing up a post on Darjeeling. It’s been a long time wish to visit this place. The sad thing is that I live most of my life in North East of India and has also travelled through west bengal many times but never had the opportunity to visit Darjeeling 🙁 The small trains are really fun and I have travelled them in both the Kalka-Shimla and nilgiris one. Its really awesome!Did you travel to Darjeeling recently? The Ghum station looks colourful 🙂 Is this a part of the Governments initiative to paint stations? Yes, I was there in April end this year.I assume it is Indian railways that paints the stations. Nicely written article that took me some 26 years back in memory. when, during Pooja holidays, we had stayed at Belle Vue at the mall, a heritage hotel in the same building which houses West Bengal Tourism Development Corp. office.We did travel to Ghoom by this toy train.I still have vivid memories of freshly made darjeeling tea, while visiting one of the famous tea estates. Thank you, Dr Biwalkar. It is always a pleasure to know that IndiTales could connect you with your memories. Stay connected. You took us through the picturesque journey with your narration and pics. Inspired by your post I’ve just booked my ticket online from Siliguri to Darjeeling which takes about six hours. I’ve done the Nilagiri trail and am looking forward to Darjeeling trip immortalised by Aradhana.please continue with your enchanting trips. Wow, that’s great to hear Chendil. Do enjoy the Darjeeling Himalayan Rail. From Siliguri you can also try another jungle safari train that runs only on weekends. Check at Siliguri station – only place where you can find information about it. Glad you liked it Neha. Darjeeling – “A LIVING DREAM” is perfect tag line for Darjeeling. It’s one of the best Hill station & Admin “Anuradha” you are right Darjeeling has good connection with Bollywood that some of Bollywood movies has shooted at Darjeeling. Hello Anuradha Mam, I do not know much about Darjeeling, after going through this post i am very excited to visit Darjeeling via train and very soon. Thanks for your beautifully describing. Aayushi, I hope you get to travel to Darjeeling soon enough. A well narrated story. Even the photos have added a great value to the story….